I became aware of my conviction in holding traditional navigational skills as a highly revered craft when I purchased a large offshore chart that needed to be folded in order to fit on Daphne’s small table. With each crease I laid in the chart, with each pleat I tucked into its edges I cringed. Silently, I made a promise to iron them away immediately upon my return to land. During planning gatherings, no one could set their mug on the chart, write on the chart, lean on the chart, or even touch the chart. And even now, after a week of steady offshore use, like a new chart in a store, the chart remains as smooth and crisp as the horizon. For years I have been torn between the beauty and simplicity (or complexity) of traditional navigation and the great advances and usefulness of new technology. I clearly remember the day I purchased my first cell phone…at my mother’s insistence. I paced in and out of the store all day long. When I finally paid and activated the phone, the employees of entire store stood. I exited to a standing ovation of cheers, whistles, and clapping. 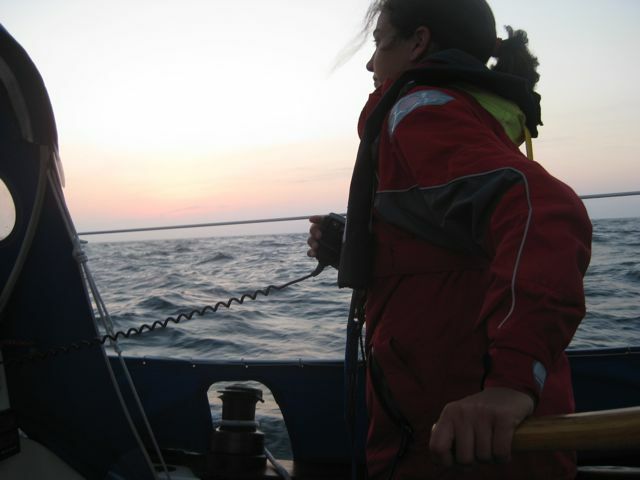 When I decided to sail offshore for an extended period of time, I began to wonder how I would manage the need for sleep. I tried sleeping one hour on, one hour off, I tried legs up to 35 hours without sleep, and I even tried sleeping in my cockpit, donned head to toe in foul weather gear, hood and all. But nothing creeps up as quickly and surprises me more than a 900 foot tanker traveling 19 knots who’s CPA (closest point of approach) is less an one nautical mile from little Daphne and her delicate crew. I decided to upgrade my electronic assistance with an AIS receiver and contacted Standard Horizon to discuss with them their new product Matrix AIS. The AIS, or Automatic Identification System, communicates a short-range signal transmitted between ships. Most commercial ships are required to transmit a signal, which gives information such as their position, speed, heading, size, and vessel name. While I slept, the Matrix served as an extra set of eyes alerting me when ships were approaching. I could then contact the vessel and arrange a safe passing with the captain. More about electronics aboard Daphne in the next few posts. Read more about my experience with the Matrix here. 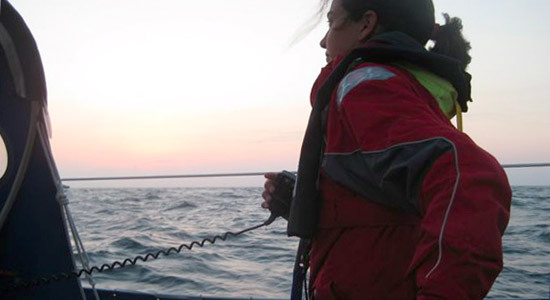 AIS has got to be the best thing in electronics for solo sailors. It is the nearest thing to being able to maintain watch while sleeping. Teresa, AIS sounds great. I can tell you during the 1st Gulf war GPS kept most of our side in position and each vehicle knew were they were located. The other side without it seldom knew there location. It wasn’t perfect and you still needed to know how to read a map using a compass. It was far better with it then without. Sometimes the problem is you count on the electronics blindly and lose your skills. Take telephone numbers. I use to know ever ones number now with a cell I can’t remember anyone’s number… Upgrades are good and keep you safe MOST of the time. Its impossible to maintain watch while sleeping. Impossible. The number one rule for watch standing is being awake and alert! Yes, an AIS is very helpful. But there are boats who do not transmit an AIS signal and certainly the AIS does not alert me for weather and other hazards. I cannot advocate having an AIS as an alternative to watchkeeping. Ben and I sail our boats solo, but in convoy and rotate our sleeping so that at least one of us is awake at all times. We are close enough that we can see each other, so that helps to. However, even with all the latest and greatest technology, it is best to have someone awake on the boat at all times, if you can. I can’t even remember my mother’s telephone number! I agree totaly about needing to be awake to keep watch. My comments above related purely to solo sailors, who are completely solo. You cannot stay awake for several days on end. As for not all boats not transmitting, that is correct, however in serious offshore sailing, most of the vessels that you are likey to encounter are either fishing vessels or commercial cargo ships, the later of which do transmit. Fishing vessels on the other hand often don’t even have navigation lights working at night. You may be interested; there was some discussion about AIS versus Radar on the Sailing Simplicity Facebook page. Are you on Facebook? Thanks Victoria for the info. I’ll try to remember to put them on both Twitter and FB from now on. No one has ever told me that, and I never checked!! No, I don’t use facebook. Keep following your dreams, Teresa! You’re not alone. I understand your conundrum between the traditional and the modern – I suffer from the same but in airplanes. Most of my friends swear by their multi-thousand dollar Garmin boxes, some complete with XM weather information, and they simply punch in their destination and follow the pink line. I love old style pilotage and dead reckoning navigation; finger on the map and my trusty E6B calculator. I would love to learn celestial navigation, even if its use in modern airspace is dubious. The real advantage to modern stuff is keeping me out of airspace where I am not supposed to blunder into in a little 1946 Piper Cub with no electrical system, let a lone a transponder (analogous to your AIS). So I compromise and I’ll use a handheld GPS, but I’ll always keep looking out the window with my finger on the map.